Beats with your besties—there’s no better way to kick off the warmer months than with a day (or several) at a music festival. Your ticket to a good time lies in dressing for comfort without sacrificing style. Whether you’re looking for a more boho Coachella-inspired look, a jazzy ensemble or a flouncy feminine frock to sway away the day, ask your Stylist for a few simple, yet essential pieces that’ll make you the belle of the (festival) ball. Dance this way for music festival must-haves. Remember, even if you’re headed to the desert, it may stay scorching hot all day, but nights can be downright cold. 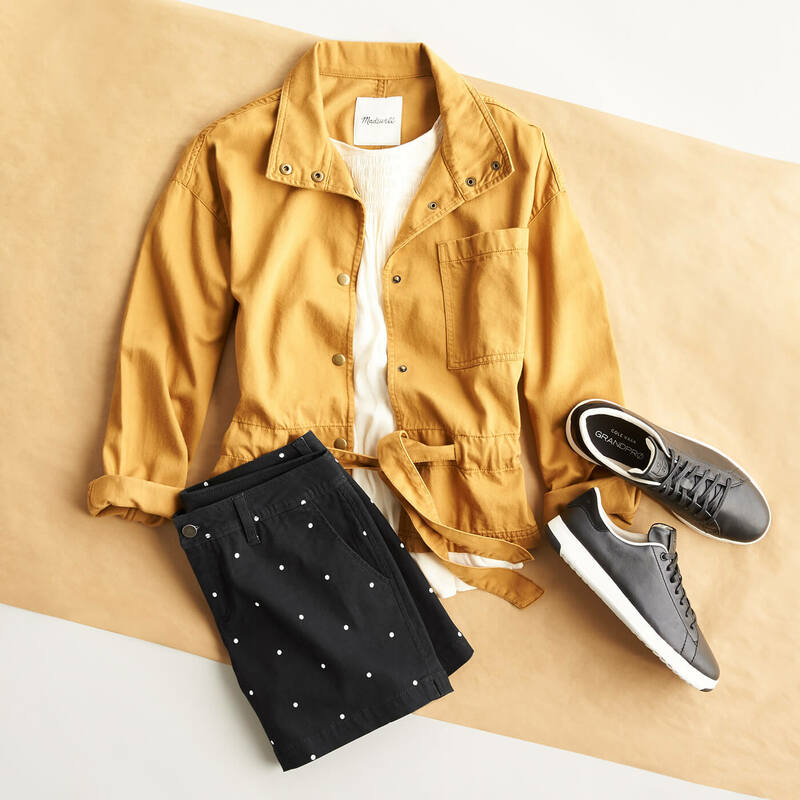 Play it smart with a lightweight layer you can wrap around your waist during the day, such as a cargo or utility jacket, and use to keep yourself warm when the temperatures start to dip. Sleek sneaks are on-trend (and oh so comfy). If ubiquitous cut-offs aren’t your thing, tailored shorts are the perfect hot-weather alternative. Just do the polka (dot). A lightweight, loose-fitting dress is always a festival crowd pleaser. You can dance to your heart’s content without breaking a sweat. Pairing it with leather or suede booties adds texture to your look and gives it a more down-to-earth, relaxed vibe. 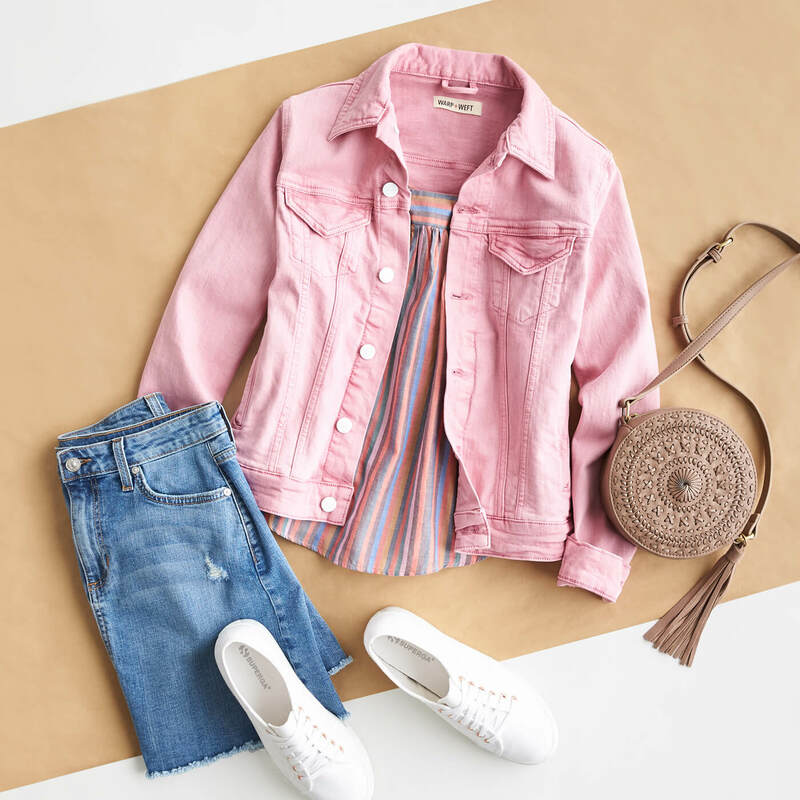 An oversized tote with a touch of boho fringe pulls the look together and is the perfect place to stash your festival essentials: think sunscreen, a colorful scarf, even leggings and a knit cardie for chilly nights. A 70s staple, the denim skirt makes for a spotlight-stealing festival favorite. A little rough around the edges, it pairs well with a breezy blouse and a sweet-as-can-be pink trucker jacket. Round it out with a straw cross-body bag to keep your hands free (and your wallet, ID and phone safe). Slip on tennies, and you’re ready to jam. Wide-leg pants are a widely popular choice for festival-goers, and for good reason. The flowy silhouette is flattering, especially when paired with a fitted knit top (tucked in) to balance the higher waist. Elevate the look with platform espadrilles and a just-the-right-size cross-body bag. 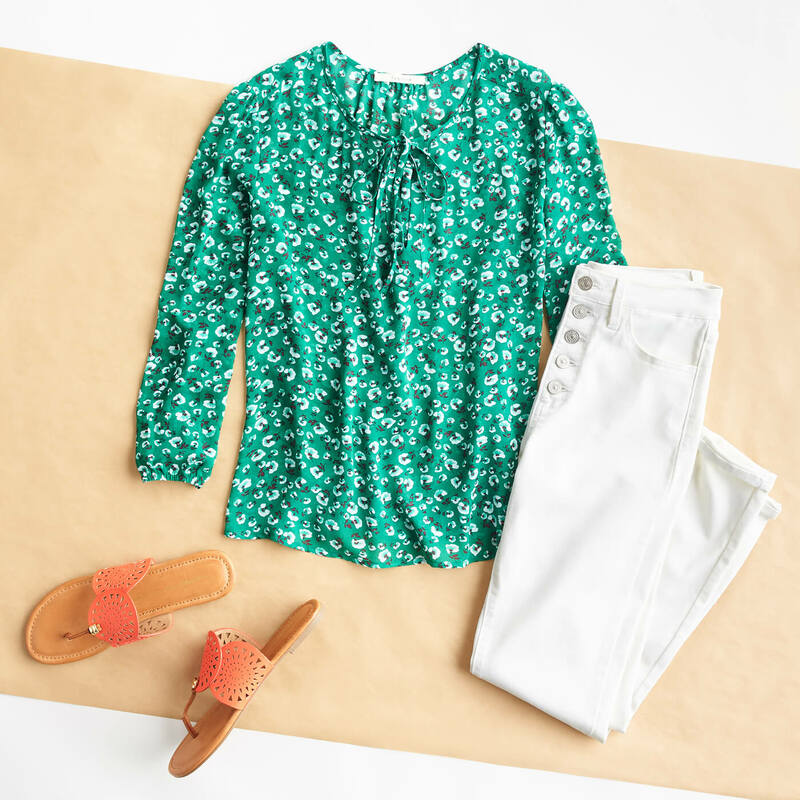 A simple pair of cropped jeans and a ladylike floral top scream timeless without your having to lose your voice. Finish the look with flat sandals in a poppy color. Effortless and easy, that’s what music festival dressing is all about. 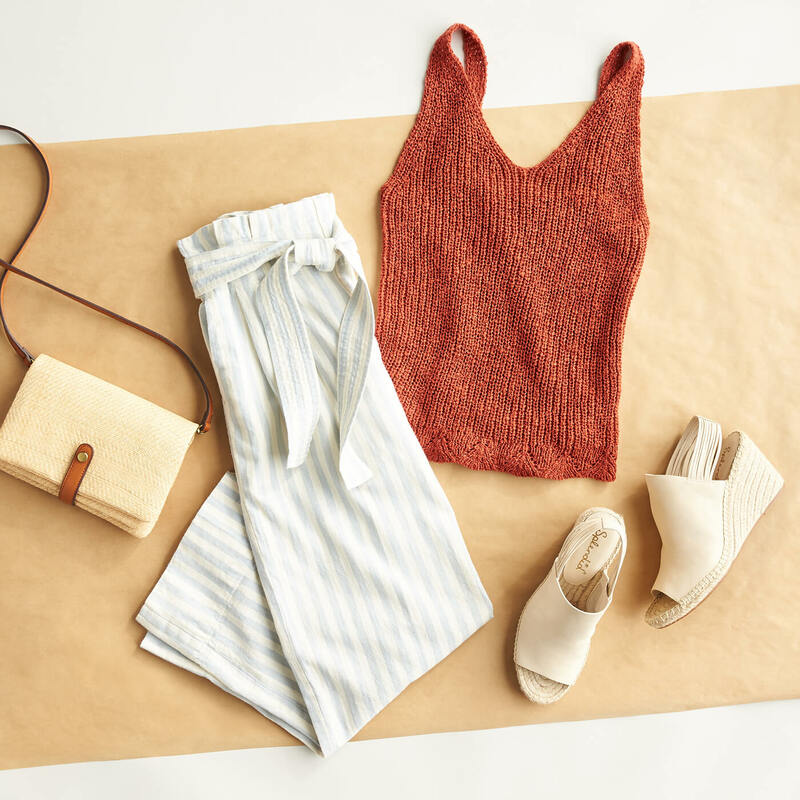 Ask your Stylist for pieces that’ll make your heart skip a beat (or two).